Does The VooDoo Zobop Full Suspension Mountain Bike Offer The Right Handling At A Low Cost? The description for the VooDoo Zobop Full Suspension Mountain Bike talks about an “adrenaline pumping performance” and “ultimate outdoor experience”. This suggests a better specification and performance than many expect for the price. The focus is purely on the off-road experience with the Rockshox Sektor 140mm forks, Shimano Deore 20 speed gearing, Shimano Altus hydraulic disc brakes and 27.5″ double wall VooDoo wheels. There are high expectations over the bike’s ability to handle the trails at speed, and the comfort that it can provide. Does it deliver, or has it cut too many corner to remain affordable? What benefits have buyers appreciated about this VooDoo Full Suspension Bike when taking it out on a test ride? 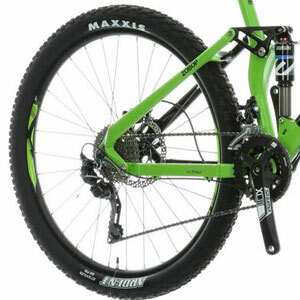 This mountain bike is all about the full suspension for a great off-road experience, and there are many buyers that are impressive with the way it handles the trails. There is more than enough here for a comfortable, fast paced ride and this is coupled with great speed and handling. It seems to live up to its claims, perhaps even exceeding expectations because of the price point. There is also the added benefit of the locking rear suspension, something that riders hadn’t expected at this low price. The other aspect of this VooDoo bike that shines through in user reports is the great look. The product description talks about a model that will “turn heads” because of the bright colour, and buyers are impressed that it looks as it appears in the photos. It is a bold design with the black branding, tyres and seat against the lime green. Still, it isn’t over the top either. Most have nothing but praise for this element of the bike, apart from those that find the paint chips away too easily. Are there any other important drawbacks to this VooDoo Zobop Full Suspension Off-Road Bike that buyers need to know about? 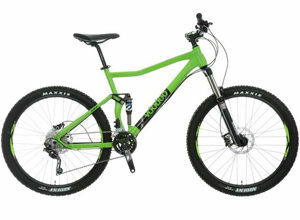 This issue with the paintwork links in with some of the other complaints that buyers have made about this VooDoo mtb. There is the general sense that this bike has some cheaper finishing touches that can be a little disappointing for more experienced rider. This includes the fact that the water bottle holder doesn’t work on smaller frames and the seat is a little more uncomfortable than it needs to be. It is also heavier than some experienced riders are used to, despite the promise of that lightweight aluminium frame. Summary: what does this all mean for the final verdict on this VooDoo Zobop MTB? Overall, there is a clear idea of value for money here. On the one hand, there are those that will look at this VooDoo Zobop and say that it could has a little more attention to detail on some of the elements, to add to the sense of quality – such as the paintwork and a better seat. However, the other side of this is that this might add to the cost. As it is, the VooDoo bike is a great value bike for those that want to get started in mountain biking and don’t want the full, high-end specification just yet. Find more reviews about the VooDoo Zobop Full Suspension Mountain Bike on Halfords here.